For a number of weeks now, my thoughts have turned to those of the morbid variety. Being a writer, these often crystallise in my mind as words, sometimes those of my peers. For example, the bon mots of a famous Caterato, an American tomcat called Blatherskite, who once said in his characteristic Mississippi drawl: ‘I do not fear death. I had been dead for billions and billions of years before I was born, and had not suffered the slightest inconvenience from it.’ Needless to say, his Human Slave, a man called Mark Twain, heard this and transcribed it into his work (which is why you, human reader, may have heard this quotation). And although Blatherskite is indeed correct, when faced with the facts of the matter, trying not to fear the end, the final full-stop to one’s existence, is easier said than done. Such macabre perambulations of my thoughts, were centred on two events which occurred recently, which I will relay to you in turn. The first episode began a month or so ago, precipitated by a visit to the green-gowned devil - I have had cause to mention her in previous missives. The visit was preceded by an uncomfortable trip in the car, where I’d somehow managed to sit awkwardly, hurting my back. This was in turn followed by a routine vaccination, the effects of which morphed me into something from a horror film. A few hours after said inoculation, which itself had been relatively painless, my muzzle blew up like a balloon and my nictitating membranes began to bulge out of my eye sockets. Needless to say this was unpleasant and caused my Human Slaves much consternation. Especially when I proceeded to void bilious stomach contents over their Persian rug. I add the last for effect - my Slaves were of course more concerned about me than said floorcloth. So, off we trundled to another green-gowned devil, who deemed it essential to forcibly insert a thermometer into… Well, the less said about that the better. The swelling had thankfully at this point settled, but my legs remained stiff. I was discharged, but had to be followed up because this out of hours devil, with his all too thorough examination, considered it necessary. Now, I had been suffering stiffness for a while, but, you know it was on and off. High on painkillers, I had almost forgotten about the dreaded follow-up until a few weeks later, when I was hoicked off to the vet’s again. Now, I was slightly concerned - perhaps they’d found something last time, which they had kept from me? Was there something in my liver, or eating away at my spleen? Was it terminal? I was reassured that only my smaller Slave was there for this particular visit. ‘If it was the end, surely they would both have been there?’ I thought to myself comfortingly, while at the same time worrying about my legacy, the loose ends of which seemed as frayed as the end of my favourite multicoloured-dangly-toy-on-a-stick-thing. But I wasn’t prepared for her reaction when I awoke from the anaesthetic. Groggy as I was, my first thought was that I was glad to be alive again. My second thought was that because my small Slave was in floods of tears, something must be dreadfully wrong. She was talking to my Taller Slave, on her phone, so I managed to glean parts of what was going on from her side of the conversation. Incidentally, he was away in Bristol at a writers’ thing where he’d been reciting one of my stories; the circularity of this didn’t fail to amuse me. To cut a long story short (as my editor/agent colleague Smilodon often suggests), it became apparent that I have arthritis. Now, I am relatively old - middle aged in human terms, I suppose - but this still came as a shock. I suppose this particular disease is one that you could associate with the process of the gradual descent into decrepitude which we know as ageing. Some breeds of cat get it earlier than others; unfortunately it seems I am one of those unlucky ones. I was coming to terms with my plight and the bitter taste of the painkilling medication, when the second thing happened. It was nighttime and my Slaves were asleep. I’d spent some time upstairs, working on tying up those loose ends of which I spoke. Finishing off those short stories which had been hanging over me for months, as well as working on the end of a novel. But I needed a break, so I padded downstairs. The night seemed to lay an odd hush over the house, almost as if the lack of light altered the way the building transmitted sound. My old bones creaked as I squeezed myself through the cat flap. Or at least, that was my perception - since I started with the pain relief, things have been easier. I haven’t exactly been running around like a kitten, although I can now jump higher than I have done for many months. I exercised this new ability by jumping onto the garden table. After a few moments, I realised someone else was also in the garden, sat on the cracked patio slabs below. ‘I wish you wouldn’t do that,’ I said to The Architect, as he moved into a pool of moonlight. ‘I hear you’ve been unwell,’ he said. ‘Athena told you?’ I asked. Athena lived on the same street as me, a few doors down; her human slave was apparently quite a famous Rock Star, or at least had managed to make a career out of it, thanks to a hit single back in the 70s. Athena had been kind enough to drop by a brace of freshly slaughtered voles as a get well present. I thanked her, but when she’d left, quickly got rid of them - as I have previously indicated, I’m fussy about what I eat and prefer my food to come out of a can with a high end brand on the side. He nodded again, but this time spoke. ‘I saw you leaping onto the table. You need to be careful; those medications can make you feel like you have super powers.’ I noticed something in his tone of voice, as if he wanted to tell me something. ‘What’s up? Something’s wrong isn’t it?’ I queried. ‘Mylo has died,’ The Architect said. My legs were suddenly heavy, like lead weights. I felt like covering my eyes with my paws, shutting out the world. For a while I just shook my head, unwilling to believe this could have happened. ‘Poison,’ The Architect replied, but failed to elaborate further. ‘Poison? Someone killed him?’ I asked, immediately wondering who could have been jealous of the cat’s prodigious talent. There were no doubt a fair few whose feelings could have spiralled out of control. The Architect nodded. Some of the autumn leaves that had fallen from nearby trees were caught by a flutter of wind. This was so sudden, it was almost as if speaking about our friend had caused some part of his spirit to return. Then, as soon as it had begun, the wind died and the leaves began to settle one by one. ‘The funeral’s next week. Where he lived, place called Winterslow. Up Salisbury way. You going to be well enough to attend?’ The Architect asked. ‘Right. I haven’t been that way for some time…,’ I said, worriedly. ‘How about I come pick you up then?’ asked The Architect. We spoke a bit more, about our friend, before The Architect once again disappeared into the night. I remember thinking it was good of him to drop by - he was usually so busy at that time of day, frantically pulling together the threads of time which had been lost. Before feeding them into that antique Victorian machine in the chine, which smoothed out all time’s blemishes ready for the next day. Mylo had achieved more in his five years on our planet than many did in a lifetime. He was a poet, his bucolic surroundings often feeding into his verse, although not in an old fashioned manner. His work was on point, up to date, tapping into some of the paranoias and worries that human society fed back into that the feline world. And it was brilliant. We’d become friends on the circuit, at some festival or another where we’d both been reading. His was a larger than life character, the central planet around which folk seemed to orbit at such events. Whether people were there hoping to catch one of the witticisms he dropped at regular intervals, or to have some of the brilliance rub off on them was uncertain. To me, he was a fellow writer, another solider who fought alongside, and fabulous company. His loss was a loss to the entire Caterati. With such a meteoric rise, who knows what might have happened if he had lived. That Mylo had died at less than half my age, put my current problems into a degree of perspective. I’d already enjoyed more that twice the amount of existence than poor Mylo. But everything was relative. Some lights burn brighter than others, and for shorter times. This fact we simply have to accept, however inconvenient. The funeral was held in the human verse of space, rather than that of the feline. It is a custom of ours to hold such events in the realm of space where one meets one’s demise. I’m not sure why this is the case, but it is a practice which goes back many years. I expect it relates to the fact that, once your light has been extinguished, it is difficult to then pass between realms. We followed the old paths, through the dusty, dank catacombs under the cathedral, and then picked up a portal which carried us over to the East of the city. The funeral was to take place just outside a village called Winterslow, where there is a large mansion house with a rather unusual sculpture garden in the grounds. It was also close to Mylo’s old stomping ground. One of his friends, a beautiful silver tabby feline called Sylvia had organised the entire affair, and was ushering cats this way and that. Well, trying to: herding cats is, as you are well aware, an impossible task. Although it was dark, a number of the sculptures closer to the house were illuminated. Amongst the artwork on display was a rather odd looking cat-like creature, the height of a human, which was provoking an interesting reaction. Other pieces just seemed to loom out of the dark: odd block-like shapes, inspired by some element of the human condition. I spent some time in the vicinity of these pieces, wandering across the neatly manicured lawns, spongy with rain. After some time, I located The Architect, and together we wandered into the small courtyard which had been commandeered for the proceedings. The place was full, as befitting Mylo’s status. I recognised many familiar faces: Ziggy was there, now a fully fledged member of the Caterati, with his debut novel making waves on the Indie scene. Athena was there too, her owl fluttering above the throng, its steel casing shimmering in the reflections of the spotlights. I remember there being something in the air, something like a pheromone that put me ill at ease. At the same time this discontent was laced with a base note of aggression. However, I’d kind of put the latter down to Sylvia’s slightly obsessive compulsive behaviour; she was grieving, after all, and sometimes this can bring out characteristics we aren’t necessarily proud of. Or perhaps it was just that everyone was at a funeral and it was a sad occasion - it had been a while since I’d been to one. As things commenced, everything had seemed civilised. Friends and relatives stood up and read out Mylo’s work, to choruses of screeches and miaows from the throng. In between readings, the air felt alive, with the vibration of the concerted purring making me think there was a swarm of bees in the vicinity. I can’t remember exactly when everything went wrong. But I think it started when a cat called Buxton, a British blue, stood up and spoke. His words were powerful, casting the finger of blame at the local farmer who had laid the poison. He called for retribution and revenge. There were murmurs of assent at this, but even then the crowd remained calm, as one, mourning gracefully. Buxton sat down and more followed. I think something must have happened as we were leaving. There were shouts for revenge, that something had to be done. There was a sudden push and cats began scrambling over each other as they made for the exit. I lost The Architect in the fray. Outside, on top of the cat statue, a young cat was whipping up the throng, her tail thrashing the air so violently that I thought she might lose her balance and fall. She was spitting words, none of which seemed to hang together. ‘Poison them!’ a tomcat shouted, which was greeted with murmurs of approval. ‘Let’s do it now! While they sleep!’ another cat shouted, this time a female. ‘Mylo would be alive, if it weren’t for that farmer!’ exclaimed another female, on the verge of hysteria. ‘Mylo was a peace-loving cat. He wished no harm to come to anyone. How is this respecting his life?’ came the reply. ‘Like what?’ asked a lone voice. Hoping to find The Architect, I followed the clowder as they marched up towards Winterslow. The crowd was making a mess of the reception table, as they quaffed large quantities of the fermented white stuff, in preparation for the proceedings. Sylvia was flapping about and was somewhat unbelievably marking things down on a clipboard; to this day, I still have no idea what she was doing. As the line of cats wound its sinuous way across the landscape, I found myself in conversation with the British Blue called Buxton, who had given the rousing eulogy. Buxton was named after a famous cat from a programme called The Magic Roundabout, he explained, before quizzing me about my current projects. The way he waited for me as we passed over a fence was touching, but made me feel my age. Perhaps I was limping - the cold had set in a bit and my legs were aching at that point. In any case, we soon found our way to the farm, where the cats were scurrying around, gingerly removing the tops of the large vats he kept in his cider shed. Soon the boozy aroma was wafting its way across to my nostrils. But at the same time there was also the sharp tang of cat piss, as one by one, cats relieved themselves into the large vats. A few of the cats fell in, had to be helped out, the liquid sticking to their coats, making them seem like thinner, rattier creatures. This went on for a time, until one of the cats jumped up onto the top of a cider press and knocked the lid onto the floor. The massive crash didn’t go unnoticed and soon lights were popping up in the windows of the adjacent farmhouse. At this point, everyone scattered. I ran as fast as my arthritic legs could carry me, and by the time I heard the shotgun go off, I was almost at the door to the portal. On the way back, without The Architect’s assistance, I found myself lost. I’d found my way to Old Sarum, but it was there the portals faded out, forcing travellers to join the older paths located in the human verse. I tentatively made my way along the deep tunnels beneath the ramparts of the old motte and bailey castle, following the immortal words of Mylo. He had travelled this way many times, and captured his experiences in a quartet of sonnets, which were celebrated for their bleak, gothic nature. These poems, like many of his others, hinted at a somewhat difficult, perhaps even sinister, future ahead. It had been the catacombs beneath Salisbury centre which had thrown me. There were too many false turnings and dead ends, and try as I might, I couldn’t find the next section of the portal system. Eventually I gave up, and found my way out via a trapdoor in an old wooden pub called The Haunch of Venison. The place was thankfully closed and in complete darkness, reeking of a mixture of spilled beer and cleaning fluids. Being one of the older public houses in Salisbury, it was naturally filled with the liminal forms of ghosts, although they seemed more than usually discontent, whispering incoherently at me. Some of them were protecting a box on the wall of the place. I hopped up from the warped wooden floorboards onto a table, to better inspect this artefact, sending the spectral forms scurrying into the corners of the room. The box contained a mummified human hand; for creatures of other realms, such a thing was like a honeypot for bees. And it drew the tourists in, some of whom would leave with a ghost mired in their spirit. Leaving this hideous artefact alone, I crept out of the pub via an open kitchen window, rimed with grease. Having licked the dirt and grease from my coat and once again made myself presentable, I made my way to the main street, hoping I would be hidden by darkness. Instead, blue lights strobed across the night and the place was a hive of human activity. Police officers were standing around, looking concerned as they watched another group of humans, dressed in some kind of luminescent protective gear, climb out of a van. Some people were shouting in the distance and I heard the buzz of a helicopter overhead. I had once to flatten myself against a wall as a large military vehicle thundered by. Something distinctly odd was happening. I had to double back to get to the cathedral, and even then I had to sneak under some police tape. Soon though, I was beneath its towering spire and from there it was a short stretch to the cloisters. Whatever had happened out in the city beyond the walls of the protected place was spooking those in the dimensions beyond. More spectral shapes skittered about, as if panicking. I ignored them and bounded down into the crypt, where I could pick up the portal network again. Eventually, with relief, I found myself back in Bournemouth, my back limbs now groaning with the effort. The Architect was waiting for me in the garden, a concerned look furrowing his brow. I explained how I’d got caught up in something, where the behaviour of humans was distinctly strange. And how their discomfiture had spilled into the neighbouring dimensions, causing an unease in the regions beyond. ‘This is a world in flux,’ The Architect said, in his usual flat tone. He explained what he’d heard was happening in Salisbury; how humans appeared to be poisoning themselves as well as some of us. ‘It makes me think of Mylo’s poems. The dark future he suggested,’ I mused. ‘He wasn’t a soothsayer, if that’s what you are suggesting,’ said The Architect, with an uncharacteristic contrariness. I supposed he knew about such matters. ‘You might be right. In any case, the clock doesn’t stop ticking. Whatever happens, time will continue its endless march forward. We are just bystanders in this, as we are in human affairs,’ The Architect replied. I was struck by the eloquence of this and thought about it for a while, as we both raised our heads to the heavens. I was still staring upwards at the sky thinking about it when I realised he had departed. I waited in the garden for a while longer, wondering if the leaves would rise up and give me another sign from Mylo. But this time, they remained still. ‘I’m not sure about…,’ started Jim. I sighed. It had been a while since I’d seen Jim. We were in a pub called The Mitre, one of our old university haunts. It hadn’t taken us long to make our way there – I’d timed the time it took from when the train arrived until we found the familiar seat in the pub’s window: less than 30 minutes. True to form, rather than browsing the library’s latest catalogue or singing in the choir, like some of the returning graduates did, we’d gone straight to the pub. Ostensibly we were there for a college dinner, but from years of experience they were dry stuffy affairs. During the halcyon years of university we’d become accustomed to pre-loading before these events, and old habits died hard. ‘Who is he?’ I asked. 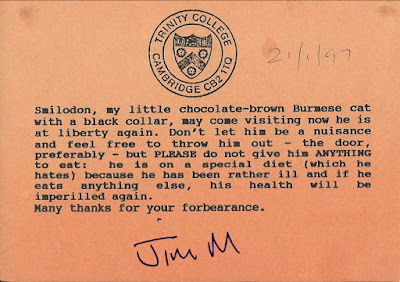 ‘He invented Twitter,’ Jim explained, a touch of sarcasm in his tone. I think he was getting his own back for the SF versus Sci-Fi comment. ‘Thrilling stuff, this,’ said Jim, managing to somehow simultaneously roll his eyes and drain his glass. 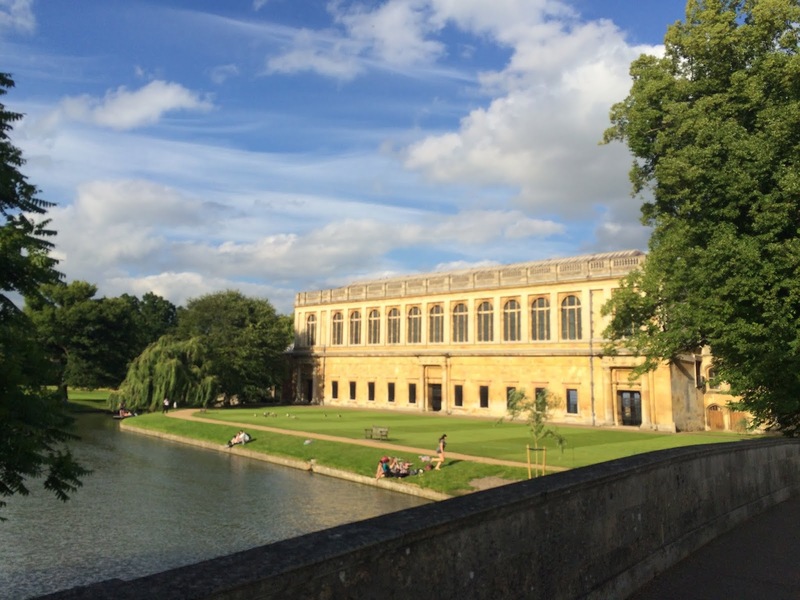 As Jim stood at the bar, I gazed out of the window, looking across to the flank of St John’s college. The street outside was busy with tourists, students, bikes and the occasional bus or taxi. I’d whiled away many hours in that same spot, often with a science fiction novel to hand, a pint in the other. Much had changed since then, but in some ways it hadn’t. The smoking ban meant that the air inside the establishment was actually breathable, unlike the toxic fog we used to have to contend with – but at the same time, I couldn’t shake the desire to step outside and spark up a ciggy. For old time’s sake. To feed the nostalgic beast inside. I wondered about the cat stories. Whether I was sabotaging my creative output by writing them rather than the more generic space opera I’d started with. Was my voice being stifled by The Cat’s feline miaows? Perhaps I should bring him to Cambridge, to where it all started. I imagined him walking down the street, looking at all the students pouring out of this very pub. Probably with disdain. ‘Toxoplasmosis,’ Jim muttered, settling a pint of Abbot in front of me on the wooden table. As I lifted it to meet Jim’s glass, I noticed it left a ring of wetness on the surface. I was sure they used to have coasters in this place, which I’d routinely tear to pieces over the course of the evening, my fingers needing something to worry at when they weren’t tapping out stories. ‘Much of what you say is true,’ Jim said, wiping some of the foamy beer from his moustache. After a few word games with this metaphorical ball, we set up Bridge Street towards the river. We battled against a tide of tourists, groups of which were lead by officious leaders brandishing selfie sticks. I’d always found the tourist side to the town frustrating as an undergraduate. They just got in the way of the purpose of the town: my purpose, I’d felt, grandiosely. But here I was, essentially a tourist, my ties to the college now withered with time. Jim stopped just before the bridge, looking inside the windows of an estate agent. There was a look of sadness in his eyes. ‘This was where–?’ I started. ‘No more free poppadums,’ we said in unison. ‘I can’t believe, given the amount we used to spend in there, he couldn’t keep going,’ I remarked. ‘Maybe he died. Probably died,’ Jim replied. At the bridge, we hesitated, and stood watching the punts go buy. The river was busy with tourists: tidy groups of more elderly travellers competing with unruly packs of younger kids. Punts were strewn at odd angles across the river – someone had tried to turn, but failed, and was now causing a huge backlog. There was the dull clunk of wood on wood, as the punts collided. Some of the European students shrieked. A young man tottered, trying to keep his balance, but couldn’t manage it and splashed into the water. ‘What was it then?’ I asked, looking at Jim’s face with concern. Abbot was a strong pint – perhaps it was having some adverse effects on my old friend. Later, as we walked across Great Court, heading toward the drinks reception in the court beyond, it felt for a moment like we had never left. The setting sun cast long shadows over the court’s central fountain, lighting the great hall from the opposite side, giving the impression it was filled with fire. A light breeze caught the sound of evensong, which then capriciously danced away again. To our left a solitary don plodded across the grass, wearing his robes as if they were as heavy as lead, tired by the Atlas-like task of supporting the weight of his knowledge. Or, given the sway of his vestments, possibly the bottles of port cached within. ‘You know what I’ve always hated about cats?’ asked Jim. ‘Just part of their greater plan,’ replied Jim. ‘Like we were part of this place’s greater plan?’ I suggested. We left Great court, passed the hustle and bustle of the buttery and great hall - the latter offering a glimpse of Holbein’s Henry the 8th through an open doorway. And then we were part of the crowd of familiar faces: some forgotten, some remembered, some even ignored. We went our separate ways, dancing through the crowd in the Brownian motion that is required of such events. And occasionally, I wondered about a group of cats doing the same, drinking pints of milk or even the bubbling fermented stuff, dancing through the shadowy cloisters. As I stepped away from the crowd of humans, they bore me away to the windows which offered a view of the backs. Offering a series of mournful miaows, they pointed at the sky. Something large was descending, something metallic and beautiful and strange. Something not of this world. It settled on the opposite side of the river, shrouded in a pall of steam or smoke. There was the peal of a gong, as the hatch beneath the craft opened. A gong struck again, bringing me back into reality: my fellow humans were pouring upwards into the great hall, following the call to dinner. I waved goodbye to the feline horde, then turned away to join my fellow alumni, leaving the cats and their giant spacecraft behind. The spiral staircase seemed to climb upwards forever, the cold stone leaching the heat from my paws. The steps were high, designed for human legs, so each one took extra effort. On each landing, I passed a number of closed doors, beside which were plaques bearing the immaculately hand-painted names of the room’s occupants. Which tense of occupant – past, present or future – was uncertain. The place was dimly lit, even for a cat’s eyes, but a wrought iron banister prevented any accidental descent. On the top landing, there was a single door, outside which stood a wooden chair. The chair was a simple structure, austere, without any of the ornate woodwork I’d seen as I’d walked past the great hall. On it sat a velvet cushion, tassels and trim in a rich gold colour; it had also been embroided with the college arms. I wondered about sitting on this, spreading my white fur over its rich purple surface. But, being a cat, I didn’t have these thoughts for long, and soon was kneading the surface with my claws. The time for my appointment came and passed. I started to wonder whether or not I should try and enter the room. It seemed to be the right place and the name S. Moriarty was painted next to the door, as expected. Here resided the cat who lead a mysterious double life: literary agent and university lecturer. I wondered about breaking and entering, but decided this probably wasn’t the best way to make a good impression. Some noise behind the wooden panelling assuaged the apprehensive feelings. Eventually the door creaked open and a number of student cats strolled out. They seemed to be sporting different kinds of hats and carried books in knapsacks strung over their shoulders. A few glanced at me without interest as they sauntered down into the gloom. One, a pedigree Siamese, stopped and began to spark up a cigarette before a booming voice behind him halted him in his tracks. ‘Not here, Master Greatorix. I suggest you withhold from satisfying your addictions until you are outside,’ spoke a moderately sized, chocolate brown-coloured Burmese, sporting a black collar. I followed the tail into the room, watching it jump onto a comfy looking armchair near the fireplace. I jumped when I heard the door behind me click closed, but before I’d had time to work out how that had happened (a series of counterweights, it turned out), the Burmese was gesturing to the opposite chair. ‘Introductions, first! Well my name is Smilodon,’ he said. ‘And I’m extremely fröhlich pleased you are here. I thought the novel was fantastic,’ Smilodon interrupted. I looked at the slightly pinched features, thrown by the interruption, and wondering what to say next. ‘Right–,’ I started eventually. ‘I find–,’ I began again, only to be thwarted once more. I stammered for a second, the German words which he instantly translated jarring my thoughts. ‘J-j-just before–,’ I started. ‘So, the book was Wunderschön wonderful! You see we have a little issue here, in Trinity. With a ghost. And given your experience, I was wondering if you could help?’ With this question, Smilodon finally stopped speaking and looked at me. ‘I know, I know… And I’m sure this book is going to be a hit. But would you mind awfully?’ he asked, looking distractedly at one of his bookcases, which I noticed was bulging with tomes. Of course, since this moment, I have had countless requests for the same thing. From readers who, to put it delicately, have difficulty separating my fiction from real life. People who actually think I am the protagonist of my novels and can achieve the same lofty feats. In a similar manner to Conan Doyle receiving requests about unsolved crimes because people thought he was actually Holmes, I suspect. Incidentally, that Smilodon's Slave is a J. Moriarty is pure coincidence – these things can happen in literature, just as they can in life. So, being somewhat naïve, at the time, I was completely thrown by Smilodon’s request. I’d come expecting to talk about literature, potentially procuring an agent, and now I was being expected to try and perform some kind of exorcism? From my research about ghosts, I knew that some could be dangerous, particularly when they crossed multiple dimensions – the energy required to do that alone could be released suddenly with catastrophic effect. ‘I’m not sure this is such a good idea,’ I suggested. ‘Oh, come now, what harm can possibly be done?’ Smilodon replied. The clock outside then struck, its note reverberating around the court outside as it marked the half hour. ‘Late for an exorcism?’ I asked. ‘Probably best on a full stomach?’ I suggested wryly. High table was in the great hall I’d passed earlier, peeking in through the open doorway as cats rushed around with silver platters. I hadn’t expected I would be returning there to dine a few hours later. In the Master’s lodge for pre-dinner drinks, Smilodon furnished me with a gown, explaining, ‘You’ll need one of these for abendessen dinner.’ It was a ropy old thing, that reeked of cigar smoke and marked me out as a visitor to the college. As glasses of sparkling Kefir, a kind of fermented milk, were passed around, Smilodon helpfully introduced me to the older dons as ‘The Exorcist’. This seemed to garner a certain amount of interest, until I explained I was a writer, their curiosity waning somewhat. ‘But you are going to help us out with the little problem in New court?’ asked a grizzled old Tomcat called Confucius, all grey whiskers and jowls. ‘I’ll try my best,’ I said. ‘Might need a few more of these first,’ I quipped, gesturing at the Kefir. ‘Ah, a fortifier. Good stuff,’ drawled Confucius, before turning to speak to another member of the college about what sounded like the perennial problem of lighting the avenue, wherever that was. At the toll of a bell, we were ushered into the great hall. Large portraits of cats adorned the walls, standing proud like lions. Their likenesses had been captured in their finest poses, their intimidating immortal gazes passing over the heads of the less worthy below. Beneath the raised daïs, rows of the student cats sat, all respectfully silent as we entered. We then stood for a while as some words of the old language were muttered by an ancient grey cat at the top of the table, who barely seemed able to move. When this was done I settled down next to Smilodon, only to be instantly confused by the cutlery on the table. I was used to eating out of a bowl – the idea of incorporating implements into this necessary, albeit pleasurable, function had always seemed to me unnecessary - seemed too much like cats mimicking their Slaves. But, rather than make a show, I tried my best to carve up the starter of pigeon stuffed with quail, which I’d been deftly served. ‘Schau mal ober, see up there?’ asked Smilodon, raising his paw to the high rafters of the vaulted ceiling. I turned away from the bird which I had by now badly butchered and of which I had failed to consume a morsel. Eventually, following Smilodon’s gesture, my eyes lit upon a wooden duck: a mallard, attached to the one of the rafters, high above. ‘Looks like a duck,’ I said, squinting. ‘How did it get up there?’ I asked. Even for a cat, the distance between the rafters would be too much to jump, the walls either side too sheer to climb without assistance. Out conversation was interrupted by one of the waiting staff. I watched the carcass of my butchered starter being removed, along with its requisite set of silver, with a sense of relief. ‘Komische…The odd thing is that the wooden bird up has its own rules of physics. I’m not sure I can describe it as well as some of my peers. I’m just a German scholar. But that duck seems to be an anchor point between the human and feline universes,’ Smilodon continued. Thinking of this trick, I thought of that which I was expected to perform in this place called New Court. I was forced to reject the vintages which were being served, much to my regret. Whatever it was I’d got myself into here, I needed a clear head, not one fogged with the heady effects of my chosen poison. The rest of the dinner passed in something of a blur, perhaps on account of my nervousness regarding the after dinner activities. I suppose it was, in human parlance, a bit like having to do a speech, traditionally left until after dinner, so it is difficult to enjoy either food and wine on offer until this is done. The fish course passed by and I managed to lick morsels off the odd-shaped knife with which I was provided. And then the desert – some kind of creamy sweet thing – I barely touched. I do have some recollection of Smilodon asking me queries about the book: my book. But it seemed these were more for the benefit of my elderly neighbour who held a large metal cone to his ear, a so-called ‘ear trumpet’, to aid his hearing. I wondered if this codger even had a human Slave, or whether he spent all his time here, ensconced in this Ivory Tower. At least I didn’t stand a chance of such a fate happening to me. Soon another noise, this time a large gong, signalled dinner was over. As before, some more of the old language was muttered by one of the dons, which I tried to make sense of but couldn’t. Although this seemed a rushed job compared to the previous effort, as if they were eager to leave. Beside me, Smilodon nodded sagely, as if understanding every word, dabbing his whiskers delicately with a napkin. ‘And jetzt now we must return from whence we came, leave this student rabble to it,’ Smilodon explained. ‘It’ll take them a while to get out – the Meister master, the decrepit old bugger, is leading the charge to the after dinner drinks. So it’ll be less of a charge, more of a funereal dirge. This way,’ he said, hopping off the daïs, and walking confidently between the rows of students, tail raised high. 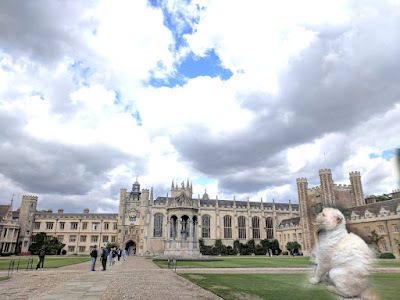 A number raised their paws in greeting – he was clearly a well-liked member of college. I followed Smilodon out of the great hall, down some more stone steps to the court where I’d met him a few hours previously. Then we wound our way across the flagstones and through the cloisters into a vaguely square court, with an architecture that struck me as a mixture of human styles: some of which they refer to as Tudor, some Gothic. Crenellations adorned the tops of the sandy coloured blocks, with towers in each corner of the enclosure. And in the centre was a circle of grass, much of which was occupied by an expansive chestnut tree. I immediately sensed something wasn’t right in that room. I could see a tormented soul, locked in the substance of a universe parallel to ours. What was odd, however, was that the figure seemed to be human. As if something terrible had happened here to that person. ‘Do you know anything about this spirit?’ I asked Tigger. ‘Only what I overheard from my Human Slave, another member of college in the human world,’ the priest replied, his soft tones reassuring. ‘This spirit is in torment. I’m not sure what I can do – it seems as if they are trapped between places,’ I remarked, gravely. ‘You mean is. She is still very much alive,’ I explained. ‘Somehow, she’s managed to her herself stuck. I scratched at the surface of spacetime, which roused the spirit into action. She sang at us, bitterly, angrily, before retreating. But in doing so, she’d revealed something to me: I’d seen the defect through which she had fallen. Now, attempting to wrangle spirits isn’t for the faint hearted. What I did next was not something I do regularly: the energy it takes out of me, the emotional cost is far too much. Such things are better left to professionals, rather than amateur dabblers like me. I flung myself again at the ghost of Charlotte, feeling spacetime warping again as I scratched at the defect between the worlds. There was a sucking sound and I suddenly felt myself falling. At the same time, I watched the spirit of the human female change into smoke and lengthen, her face one of confusion and shock. The smoke was sucked away, extracted from this plane of existence, her form returning to her own world, where she would once again take corporeal form. Then, when I tried to return, something had changed. I felt myself being pulled into this odd bubble universe between ours, and scratched with all my strength at the fabric of our universe. For a moment I felt like I was going under, destined to haunt students like Charlotte before me. But then, summoning all my strength, some field somewhere finally snapped and with a burst of light, I was flung across the room, crashing into the wall beyond and dislodging a picture frame which hung there. As I landed on the floor, the frame followed, but I darted out of its way just in time – as it hit the deck, both wooden frame and the pane of glass within splintered, large chunks of the structure embedding themselves in the wooden floorboards. Smilodon and Tigger stared at me aghast. It was only later, when I found a mirror, that I realised how dreadful I looked. My fur had been singed and my soft cream coloured fur was blackened. As was much of the room, its pristine white walls now bearing large smudges of black. ‘Well, I think I need to go home now,’ I muttered, staggering for the door. ‘Right… Well, anyway, I’ve had enough of this. 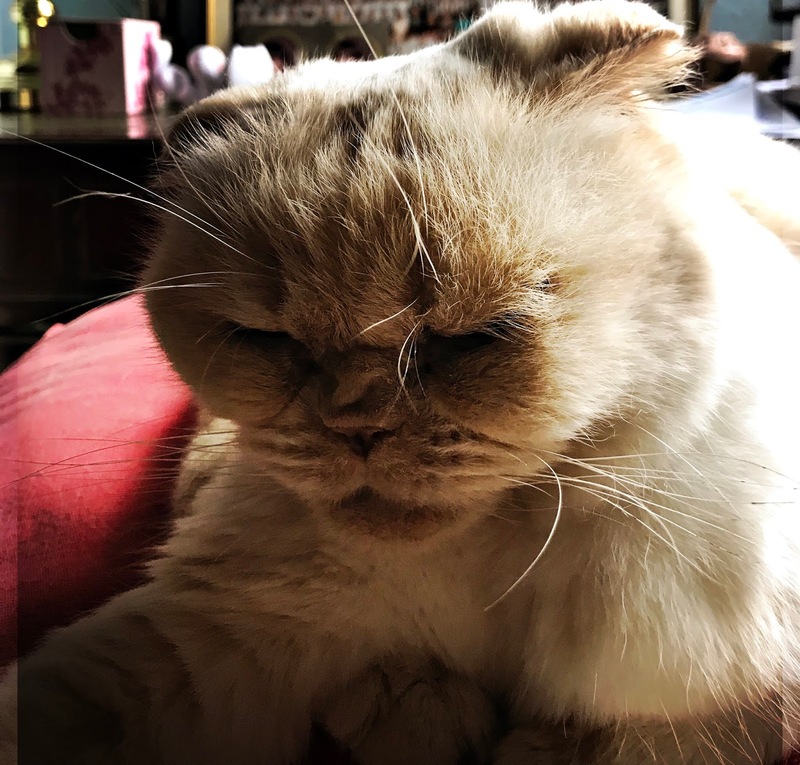 I’m a cat and a writer, not some kind of performing monkey,’ I spoke bitterly. And with that, I left Smilodon behind, heading across the courts and back outside the college to All Saints Passage. Soon I was back in Bournemouth, my Slaves fussing over me, as they wondered what the heck had happened to their cat. Luckily, much of the burns were superficial, my undercoat spared, so the sooty stuff brushed out. I let them pamper me. A week or so later, I received a message from Smilodon. He apologised for what had happened, and assured me if I would still consider to let him represent me, he wouldn’t mess around with the spirit world any more. As a postscript, he also told me that Charlotte, the human I had managed to release from the limbo universe, was now back at college and studying. The police had interviewed her on a few occasions, trying to work out what had happened the weeks she’d been absent, but she couldn’t remember anything. Her boyfriend, who had been held under suspicion of murder, was eventually released from custody. In the years since, I gather Charlotte’s studies went well and she eventually graduated with a first in Anglo-Saxon. I kept Smilodon hanging on few a few more weeks, before I finally agreed to his terms. 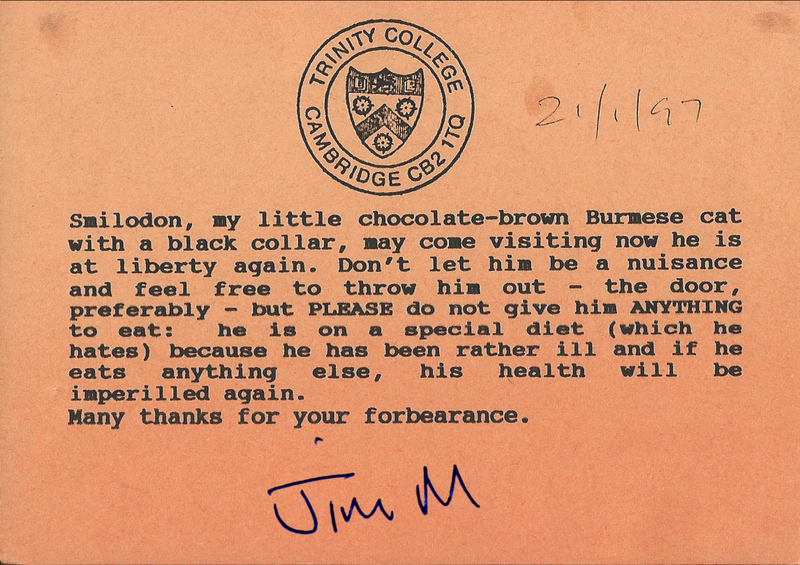 The next time I returned to Cambridge, his tone remained as humble as in the letter he’d sent. He took me to a fine restaurant on Midsummer common, where the Cambridge Caterati usually hung out. And thereafter, not only did I call him my agent, but we also became great friends. That fateful night was not mentioned again, until I felt compelled to use the events in one of my novels - with a fictional slant of course, a roman à clef if you like. Perhaps what you read above is the real thing, or perhaps it is my fictional account of what transpired – my memories have been so warped by the fiction I created around them, I can no longer remember the truth. Nevertheless, when I presented him with this manuscript, we had what you might call an interesting conversation.